In my household Christmas over the past few years has been pretty predictable (I suppose you could say Christmas has been pretty predictable for the last couple thousand years but I'm referring to Christmas in terms of our municipal life…:)). There's the Merry Old town celebration – Santa shows up on the train, we participate in the tree lighting and have a great dinner out. I've spoken at a few of the tree lightings and it was an incredible experience and honor. The museum lawn is normally filled with people, your friends and family are there and it's a cold! but a quick ceremony. At the podium you can't see anything anyway: the lights blot out the entire crowd. This year we decided not to go as the weather was lousy and the daughter was off with her friends. We stayed home and binge-watched some tv…. The Christmas parade is the next day. I've been fortunate over the past few years to walk or ride in the parade with my daughter. I have always enjoyed walking with her and waving to the assembled folks although I'm sure she attaches no particular value to it and would rather be elsewhere. Indeed, this year I did want to walk in the parade with her but she elected to help with the Rotary interact club and ride on their float so, instead of walking with the Council I decided to volunteer to work the parade. 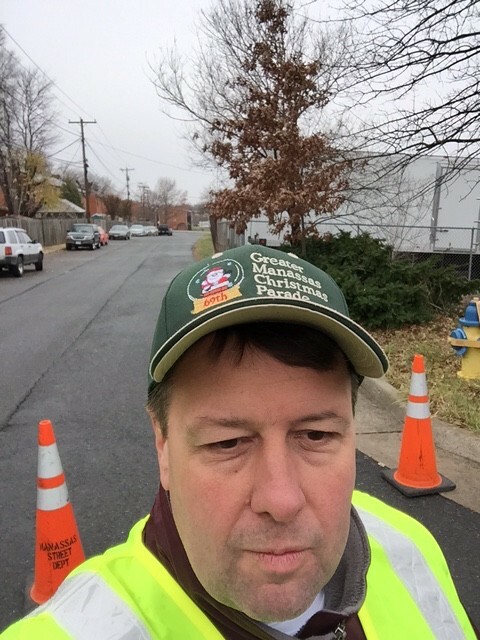 As "The New Guy", I was assigned to work what is, for one day of the year, the busiest intersection in Manassas. It's far removed from the parade route (indeed, you can't even see the parade) but it controls access to the "back door" of the staging area. If you are facing the bowling alley on Mathis avenue, it's the route that goes to the right of Bowl America and allows you access to the alleyway behind the shopping center. At the back corner of Bowl America you can go right down to Reb-Yank drive or left up to Portner and/or Sudley. If you go right towards Reb-Yank you'll encounter a street full of floats, children, etc but you can't see that from the bowling alley so the alleyway – to the right- behind Bowl America is closed. Of course, if you just use cones and don't put a body there it'll be about 10 seconds before somebody gets out and pulls the cones out of the way and the net result of that is chaos over on Reb-Yank drive. 1. Is it possible to operate a car without a cell phone in your ear? My car is a couple of years old so maybe this is a new feature….. However, If I don't have my phone my car still works! Honestly, these people appear to be conducting important business too! Driving the car is really secondary. Waving their arms around and yelling…it's amazing. I don't seem to have this problem and I admit I'm conflicted about it. I get about 2 calls on my cell phone a day. They're usually from my wife (daughter doesn't seem to be able to operate a phone although she can text like a demon). These calls usually last about 2 min. These people are clearly far more important than me. Honestly, I appear to be clinging to the bottom of the evolutionary ladder here. I'm not sure what happened. 2. How is it that almost nobody that stopped to ask me for information seemed to know that the Christmas parade was going on? I had one guy – from Manassas – who stopped to lament all of these "new parades" that jam up the city. I pointed out that this was the 69th year of the parade but he was unconvinced and very angy he would have to go to Westgate to get to the ABC store. The closest I came to a fight was one guy driving a giant Escalade who started cussing me because I wouldn't let him down the alley. I explained to him "sir, I do this once a year. I don't do it to piss people off, I do it to serve my community. If you really want to go down this alley, I'll move the cones. When you get down there, you will find a street clogged with children, animals and floats so go right ahead." He mumbled an apology and turned the other way. Here's what about 4 minutes looks like in that alley!! 3. This one verges on "you kids get off my lawn" but I'll risk it: why can't anyone give their fellow man a couple of feet or a couple of seconds of accommodation? Honestly, if people slow down a bit the guy behind him swerves around him and passes him. The closest call all day long was when a minivan slowed down to let a mother with a stroller cross in front of her and 2 guys in a minivan (the driver was yelling at someone on his phone) swerved around her – didn't stop and wait and then get frustrated, just swerved – and almost ran over the stroller. If I hadn't have seen it coming and started walking towards the van and yelling he would have killed that baby and maybe the mother. Cyclists are killed regularly by the actions of impatient drivers so I'm used to it (which is a sad commentary) but it's a frigging parking lot! 4. Far too many people are still texting while driving. A teenage girl drove up to the cones with her turn signal on. She looked up long enough to not run me over but then returned to her phone, furiously banging out what was certainly an urgent text message upon which world peace must certainly have depended…..and didn't look back up for about 10 seconds. I'm pretty sure she expected me to just move the cones. I just stood there. She looked back up, perplexed that nothing had happened. I think she probably wondered, if just for an instant, she could send me a text message wondering what the matter was? I pointed the other direction. She dashed off another text and turned around. Love your observations. Crossing guards and teachers on duty at schools can empathize with you. The curiousness of parades…Steve Randolph, I think, once told me the Jaycees marched in the parade with a blanket and people would toss money into it as donations for them to buy toys for needy children. I wrote in a short story that the veterans after WWII "marched the human pageant of everything they'd fought for down Main Street." — there is comfort in community ritual. everything at cost to help each child's allowance "expand". be a special Manassas Christmas memory. Mr. Randolph, Manassas is going to miss your wealth of knowledge of the past of our beautiful town. I remember so well the Jaycees blanket and the Christmas shopping at Rohr's. I lament every day that we cannot bring back those days and they are gone but for our memories of what I think of as the good old days. Something is lacking in our community now but this is a result of society's changing priorities and the lack of people willing to serve the community in Jaycee type of organizations anymore. Enjoyed this post, tremendously. I shall, from this day hence, address you as Andy "Rooney" Harrover. Note that I think special events like our parades, 4th of July, Railway Festival, etc. community. (A special thanks to the volunteers to play such a key part).